Union Minister of Steel Chaudhary Birender Singh visited Kalinganagar on 12th June, 2018 and interacted with MDs/CEOs of major steel producing units located in the State of Odisha. In his remarks the Minister stated that India has become the second largest steel producing country. In the financial year 2017-18, India produced more than 100 million tonnes of steel. Indian Steel Industry has come out of the difficulties faced during 2014-15 and 2015-16 due to various policy interventions by the Government of India. National Steel Policy and DMI&SP Policy were notified during 2017 giving direction and fillip to the domestic industry. Odisha is a major steel producing State contributing more than half of steel production in the country. It is rich in minerals and mines and has a potential to produce 100 million tonnes of steel out of 300 million tonnes envisaged in National Steel Policy by the year 2030-31. Kalinganagar is a major industrial hub. Around 15 steel plants are located in this region which include public sector plants like NINL and private sector plants like TATA Steel, Jindal Stainless Limited, Visa Steel and MESCO. To achieve the common objective of producing 300 million tonnes by 2030, enhanced production from Kalinganagar and Odisha State is important. The Minister expressed the hope that Kalinganagar will develop potential for downstream facilities which include ferro alloy plants, duct iron pipes, steel furniture, power component manufacturing as well as stainless steel units. Industry representatives spoke about increased need for utilizing iron ore fines for pellet manufacturing so that precious iron ore can be preserved. The Minister discussed in detail the challenges to the growth of Indian Steel Industry, such as logistics in terms of development of ports and increasing capacity of Indian railways, creating dedicated freight corridors to move raw materials as well as finished goods. The Steel Minister expressed confidence that both Central Government and State government together find solutions at policy and operational level to achieve higher level of production in Odisha. P&G India recently concluded it’s first ‘Women Business Empowerment Program’ in India with its partner WEConnect International. 20 women entrepreneurs, who were selected via an application process graduated from the four-week program aimed at developing capability of women entrepreneurs. As part of the program, P&G conducted training and workshops with real-time case studies covering various aspects of building a sustainable business including professional skills like consumer engagement, digital marketing, legal and tax system, effective communication etc. Taking this a step further, the holistic program also provided women entrepreneurs access to business opportunities with P&G and its partners. Through the holistic Women Business Empowerment program, 25% of participants secured business opportunities with P&G and its partners. The training sessions and workshops were mentored by senior leaders from P&G and prominent women leaders and entrepreneurs from across industries. P&G India has committed itself to sourcing US$30 million from women-owned businesses across India over the next three years. This initiative to support women entrepreneurs is built on P&G’s global commitment to promote greater gender equality in line with the United Nation’s Sustainable Development Goals. Procter & Gamble (P&G) India along with its partner WeConnect International recently concluded the Women Business Empowerment Program in India. 20 women entrepreneurs, who were selected via an application process, graduated from the four-week programme aimed at developing capability of women entrepreneurs. As part of the programme, P&G conducted training and workshops with real-time case studies covering various aspects of building a sustainable business, including professional skills like consumer engagement, digital marketing, legal and tax system, effective communication and others. Taking this a step further, the holistic programme also provided women entrepreneurs access to business opportunities with P&G and its partners. Through the holistic Women Business Empowerment programme, 25% of participants secured business opportunities with P&G and its partners. The training sessions and workshops were mentored by senior leaders from P&G and prominent women leaders and entrepreneurs from across industries, including Richa Arora, COO, Consumer Business, Tata Chemicals; Simran Hoon, Executive Vice-President, Viacom18; Poorvi Chothani, Founding and Managing Partner, LawQuest; Vineeta Dwivedi from SP Jain Institute of Management and Research (SPJIMR); Richa Pai, FMCG Merchandising head, Aditya Birla Retail; Aarti Bindra, Managing Director, ACPL Systems, Kalpana Anantraman, CEO, Avion Systems and Gauri Sawant, transgender activist and Managing Trustee, Sai Savli Foundation and Founder ‘Aaji Cha Ghar’. P&G India has committed itself to sourcing S$30 million from women-owned businesses across India over the next three years. This initiative to support women entrepreneurs is built on P&G’s global commitment to promote greater gender equality in line with the United Nation’s Sustainable Development Goals. Gender Equality is a priority focus area of P&G’s Citizenship efforts. P&G has been steadily working to improve gender equality by leveraging its unique strengths in partnership and collaboration with industry stakeholders. P&G has also announced a series of measures designed to support a push towards gender equality across the Indian Subcontinent, Middle East and Africa region and the recent initiative in India is another strong statement in that direction. Union Minister for Water Resources, River Development and Ganga Rejuvenation Shri Nitin Gadkari will preside over the signing of the Concession Agreement for the development of sewage treatment plant through Hybrid Annuity based Public-Private Partnership for India’s first city-wide integrated sewerage infrastructure for Mathura and signing of agreement with IOCL for the re-use of treated waste water for Mathura refinery. Shri Dharmendra Pradhan, Union Minister for Petroleum and Natural Gas & Skill Development and Entrepreneurship along with Union Ministers of State for Water Resources, River Development and Ganga Rejuvenation Dr. Satya Pal Singh and Shri Arjun Ram Meghwal will also grace the occasion. Union Minister of State, (I/C) for Micro, Small & Medium Enterprises (MSME), Giriraj Singh will interact with media on 4 years achievement of Government. Shri Thaawarchand Gehlot, Union Minister for Social Justice & Empowerment will preside over the “3rd Meeting of National Council for Senior Citizens” Shri Vijay Sampla, Minister of State for Social Justice & Empowerment and Secretary, Department of Social Justice & Empowerment, Ms. Nilam Sawhney will also be present. OPENING RECEPTION: JUNE 16, 6 PM – 8 PM 2632 S. La Cienega Blvd. 2632 S. La Cienega Blvd. Baik Art is pleased to present B.A.D. Summer, a multidisciplinary collaboration including works by Jonathan Casella, Mark Cooper, and Kim Eull. This exhibition highlights the nature of each artist’s practice as they navigate commercial signifiers, art historical tropes, and contemporary kitsch aesthetics. This exhibition will be on display from June 16, 2018, through September 8, 2018. An opening reception will be held on Saturday, June 16, 2018, from 6 pm – 8 pm. As the lines between globalized spectacle and institutional preservation become increasingly blurred, it is imperative to approach such endeavors in ways that prove adaptive and experiential. This exhibition reflects on the ability of creative practice to traverse both informed viewership and mass accessibility by blending a multitude of cultural signifiers. 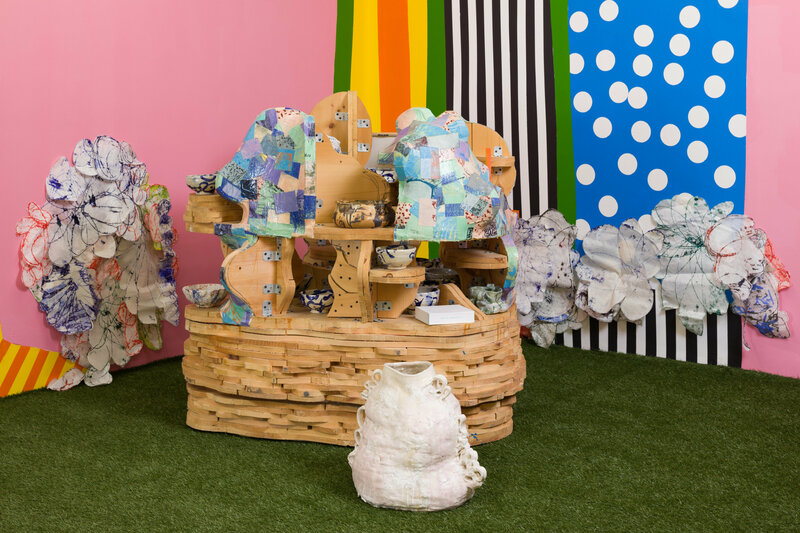 The vibrant and encompassing installation looks to challenge notions of taste and connoisseurship as well as the role of craft objects within the canon of fine art. The show’s emphasis on traditionally industrialized motifs such as clocks, shelving units, and books examine the commercialized exchanges around art and the resulting cultural homogenization that occurs within domestic and institutional spaces. Distinctions between academic austerity and marketability are then renegotiated through the artist’s contrasting use of fine art objects, stylized furnishings, and omnipresent barcodes. A point further highlighted by the storefront’s eccentric retail-esque display. Akin to other artist groups such as Danish collective, Superflux, B.A.D. Summer’s collaborators look to develop experimental and participatory experiences that challenge socio-economic status, art historical tradition, and cultural representation. This grouping of internationally based visual artists aims to build on Baik Art’s continued focus on global collaboration, experimentation, and ideological exchange. B.A.D. Summer marks the launch of Baik Art’s online design store, which will act as an extension of our fine art exhibitions. Baik Art Design [BAD] will provide global offerings of art editions, hand-made goods, and gallery publications in an effort to make our programming more accessible to our viewers and future patrons.